Car owners should make sure that they get propane tank that’s certified by the local transport authorities. It’s also imperative for the tank to include essential safety features that the local laws require. Propane tanks for cars should be durable and rupture-free. It is highly advisable to avoid purchasing used propane tank. It simply regulates the amount of gas that’s sent to the carburettor. There are different hoses needed to complete the conversion procedure. 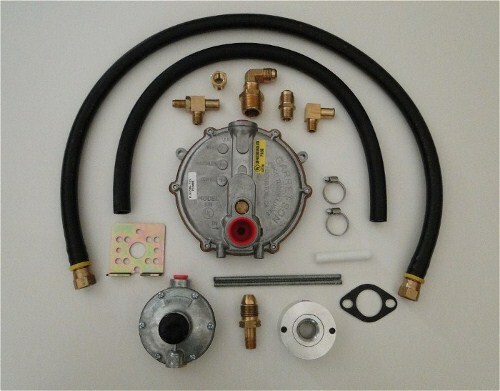 One hose is needed to deliver liquid propane to the regulator and another is used to connect the regulator with the carburettor. Copper tubing and “Y” fitting are needed to connect the hoses. Brass reducer is also required to control the vapour emission of converter. To keep the installation in place, multiple fasteners, compression fittings, nuts, bolts and clamps are also needed. It is highly advisable to get a conversion kit instead of purchasing these components separately. A conversion kit may cost around $3,000, depending on the type of the engine. For average car owners, it is better to ask professional to do the conversion job for an added assurance. There are different types of conversion systems and the converter-mixer is the most common. It simply converts liquid propane into vapour at specific density. Other than the oldest method uses, it’s also the most common. The vapour-phase injection is nearly similar but it includes various electrical shutoff injectors that are controlled by the computer. The computer accurately defines the amount of propane needed and assures its delivery to the carburettor. The liquid-phase injection system is a bit more unique because it lacks the converter (regulator). It delivers propane through a rail-like system. These methods have their own benefits and drawbacks that should appeal to different car owners. Regardless of the system used, propane-powered cars could still offer among the best mileage in the automobile market. Due to its unique advantages, many car owners are considering to convert their gasoline-powered car to propane. There should be minimal hassle and difficulty associated with this project if car owners choose kits from trusted brand and can work with reliable mechanics. A significant concern would be the relatively large initial investment, but propane kits should still benefit users due to the low-pollution rides and long-term fuel economy. In fact, converting the car to support propane is more affordable than many customization projects that don’t contribute anything to the efficiency and performance of the car.